The following (edited) article was first published by the Friends of Old Portsmouth Association in their Newsletter No. 6 in 1991. We are indebted to FOOPA for permission to re-publish on this site. A later article on related matters from the same source appears as "Banking in Portsmouth" in the Events section. No. 60 stands on the north-east corner of Grand Parade, where it meets High Street. It has no name, but could perhaps have been called 'The Old Bank' because that was it's role for most of the time since it was built in 1786. The history of the site however, goes back much further than that. An ancient map of Portsmouth, dating from the reign of Henry VIII, shows a string of gabled houses along the side of High Street from what is know Pembroke Road to Grand Parade, and it may well be that one of those houses stood on the site of No. 60. In 1692 the land on which it would later stand was leased for a thousand years to Matthew Peate, gentleman, by the Mayor and Burgesses of the City, at an annual rent of 3s.6d. plus one fat capon. At that time Matthew Peate, who had joined the Navy in 1689, was serving as a Lieutenant in the 'William and Mary'; he retired as Captain of a Third Rate in 1711 and died in 1719. By the time of his death Peate had also acquired the Manor of Parva Gadcombe and land in Portsea and Wymering and it is because of a later High Court case, involving ownership of that land, that a copy of his will is held in Portsmouth City Records Office. From this we learn that the site was left to his daughter and her heirs and then to his grandson Matteate Brady, about whom nothing has yet come to light, except that by 1785 he was eleven years in arrears with his capon rent of ls.3d. a year. The will also reveals that the original gabled house was first occupied by a gentleman named Hugh Grove and the old rate books record the change of tenancy in 1759 to Richard Carr who established a business as bookseller and printer. It was in 1781 that the property was acquired by Peter Taylor, described by the Historian Henry Slight as a notable commissary who, we may imagine, made a living furnishing the Army Garrison and Naval Vessels with provisions. 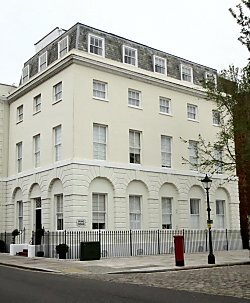 In any event, he made enough to build the present house to a design commissioned from the distinguished architect Samuel Wyatt, who was at that time engaged in the design and construction of Admiralty House in the Dockyard. The High Street was at this time considered one of the finest streets in the country with a wide variety of quality shops and thriving businesses. Not surprisingly, many distinguished Naval Officers were numbered among its residents and the first recorded occupant of the newly built No. 60 was Captain Sir Francis Hartwell, then in command of the 'Bellona' of 74 guns but later a Commissioner and Deputy Controller of the Navy and a Baronet. The house attracted the attention of local businessmen interested in founding a Bank, more prestigious perhaps than that established by Grant & Burbey, merchants and grocers, at No. 46 High Street in October 1787. Before the end of 1788 Messrs. Griffiths, Chaldicote & Drew were already installed in No. 60 and its life as a Bank had begun. These were laissez-faire days for Bankers with no external regulations or independent auditing, and anyone whose social standing and financial reputation inspired enough confidence and private customers could join in. The enterprise at No. 60 came to involve a variety of local dignitaries, chief among them being John Godwin, seven times Mayor of Portsmouth, and father of the Corporation. 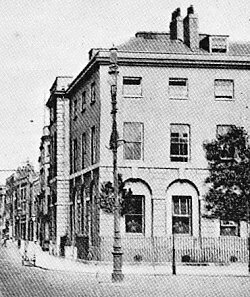 Indeed, the business was known as Godwin's Bank until finally acquiring the more formal title of The Portsmouth, Portsea and Hampshire Bank. For thirty years or so - a long time for a Bank of those days - the firm prospered and came to be regarded as safer than the Bank of England. A bound ledger for 1798, held in the archives of Lloyds Bank, records a variety of transactions by commercial and private customers, and the influence of the Navy is apparent with entries relating to victualling, subsistence, prize money, and so forth. Yet there are two pages which show that the Bank was not averse to modest speculation. In February 1798 a half-share was purchased in 20 tickets, costing £12 apiece, in one of the state lotteries, then a recognised means of raising Government funds. The ledger goes on to record that no fewer than four of the tickets drew prizes, three of £16 each but for ticket No. 45646 the staggering sum of £10,000. Although the cost of the tickets seems to have been met from the general resources of the Bank, it is noteworthy that the proceeds were credited to two private accounts identified by initials only. Luck ran out, however, in November 1818 when the Bank was declared bankrupt, with dire consequences for the city. At the time, banknotes to the value of £90,000 were in circulation. Seven writs were issued by the Crown and, as Henry Slight recorded in 1828, "By this event, public credit was shaken to it's very base: property to an immense amount changed possessors, and years have not repaired this mischief." It was not until 1827 that the Bank's affairs were wound up with a final dividend of ten shillings in the pound declared. One would have thought that the banking history of the house would have ended there but it was not to be for immediately after the 1818 failure the house was acquired by the Grant family (formerly of No. 46) and banking continued under their name and those of various partners until 1888, when amalgamation with a Southampton firm led to the creation of Grant & Maddison's Union Banking Company, with assets in excess of £500,000. In 1903 the firm was taken over by Lloyds Bank who continued to use No. 60 as the High Street Branch until moving to a site at No. 33 in 1920. Even this was not the end of it's banking days, for although the house was bought by the Diocesan Board it was leased back to Lloyds Bank when No. 33 was destroyed by enemy bombs in January 1941 and remained a Bank until new Branch premises were built in October 1956. And now that the building is once more a private house, even though divided in two, what remains of the original? Remarkably, the exterior up to the roof level has scarcely changed at all, as sketches and prints of 1805, 1829 and 1860 show. As for the interior, most of the principal rooms on the ground and first floors, of handsome proportions and with elegant ceilings, remain, while the well-worn treads of the horseshoe staircase at the rear shows how brisk business once was. Other evidence of its banking past are the ground floor and cellar strongrooms which were left undisturbed, possibly out of nostalgia, but more likely because they were too difficult or costly to remove. So far, this account is supported by documentary evidence and historical references and it has all been singularly dull. However, the cellar does contain an ancient tunnel, leading northwards but blocked off long, long ago; and the story passed on from owner to owner is that it was once used by customers at what is now the Sally Port Inn to escape from the press gang. The rest of the extensive cellars were also said to have been used on one occasion as temporary accommodation for French prisoners in the early 1800s.